A new women-only motorsport series will "segregate" female racers and is a "sad day for motorsport", says British IndyCar driver Pippa Mann. "I am deeply disappointed to see such a historic step backwards take place in my lifetime," said Mann, 35. In a tweet on Wednesday, she added: "What a sad day for motorsport. Those with funding to help female racers are choosing to segregate them as opposed to supporting them." 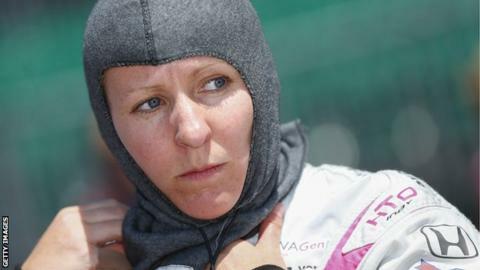 "I stand with those who feel forced into this as their only opportunity to race," added Mann, who competes in the IndyCar series and was the first British woman to race the Indy 500 in 2011. "I stand against those who are forcing the above mentioned racers into this position as their only solution to find the funding to race." Catherine Bond Muir, the chief executive of W Series, said the aim was to "show the world just what women are really capable of". But motor racing driver Charlie Martin, who hopes to be the first transgender driver to compete at Le Mans 24 Hours and has competed in the Ginetta GT5 Challenge, echoed Mann's comments, saying she found the proposal "jarring". She said: "This series is founded on segregation, and while it may create opportunities for some female drivers, it sends a clear message that segregation is acceptable. "We don't discriminate in sport based on race, so it is particularly jarring that we feel it is acceptable to do so based on gender in 2018. As racers, we want to compete against the best drivers - regardless of age, race, sexual orientation or gender - and prove we are the best at what we do." She said: "As female racers we are racers first, and our gender comes second. We grew up dreaming of winning races and winning championships, against everyone - the same as every male racer does. We did not grow up dreaming of being segregated and winning the girl's only cup."